The Pioneer Venus project was part of the Pioneer program consisting of two spacecraft, the Pioneer Venus Orbiter and the Pioneer Venus Multiprobe, launched to Venus in 1978. The program was managed by NASA's Ames Research Center. An official Ames documentary film titled "Venus Pioneers" is visible on George Van Valkenburg's YouTube Channel. 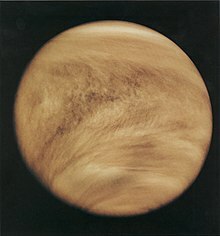 The Pioneer Venus Orbiter entered orbit around Venus on December 4, 1978, and performed observations to characterize the atmosphere and surface of Venus. It continued to transmit data until October 1992. The Pioneer Venus Multiprobe deployed four small probes into the Venusian atmosphere on December 9, 1978. All four probes transmitted data throughout their descent to the surface. One probe survived landing and transmitted data from the surface for over an hour. In May 1992 the orbiter began the final phase of its mission, in which the periapsis was held between 150 and 250 km until the fuel ran out and atmospheric entry destroyed the spacecraft in August 1992. The Pioneer Venus Multiprobe was launched on August 8, 1978 on an Atlas-Centaur rocket. It consisted of a 290 kg bus which carried one large (315 kg) and three small atmospheric probes. The large probe was released on November 16, 1978 and the three small probes on November 20. All four probes entered the Venus atmosphere on December 9, followed by the bus. The three small probes were identical to each other, 0.8 m in diameter and 90 kg each small probe. The small probes were each targeted at different parts of the planet; They had no parachutes and the aeroshells did not separate from the probe. The Pioneer Venus bus also carried two experiments, a neutral mass spectrometer and an ion mass spectrometer to study the composition of the atmosphere. With no heat shield or parachute, the bus made measurements only to about 110 km altitude before burning up. ^ a b c d e f "Pioneer Venus Project Information". NASA Goddard Space Flight Center. Retrieved August 17, 2016. ^ Pioneer Venus Probes. NASA Goddard Space Flight Center, 2005. "The Pioneer Venus Orbiter: 11 years of data." Results published in May 1, 1990. This page was last edited on 17 September 2018, at 22:10 (UTC).